The Britax Marathon is one great car seat. It's pricey, but many parents say the cost is worthwhile. Britax has taken much of the guesswork out of properly fitting your baby into a convertible car seat, with plenty of convenience features built in. Over the years, Britax has built upon its popular original Marathon car seat, and now there are two versions available: the Marathon G4.1 and the Marathon ClickTight. Both current Marathon models can be used rear-facing from 5 to 40 pounds and forward-facing from 20 to 65 pounds (must also be at least 1 year old). The big difference is that the ClickTight version has a unique installation system that's incredibly easy to use. Just open the "flap" in the seat, route the seat belt or LATCh belt correctly and remove slack, then close the flap. The flap then acts like a belt lock off to hold it tight. Built-in lock-offs for seat belt installations. Some covers may fray easily. Some toddlers may be able to reach the harness release and loosen their straps. This car seat is heavy! May be difficult to install rear-facing in compact cars. 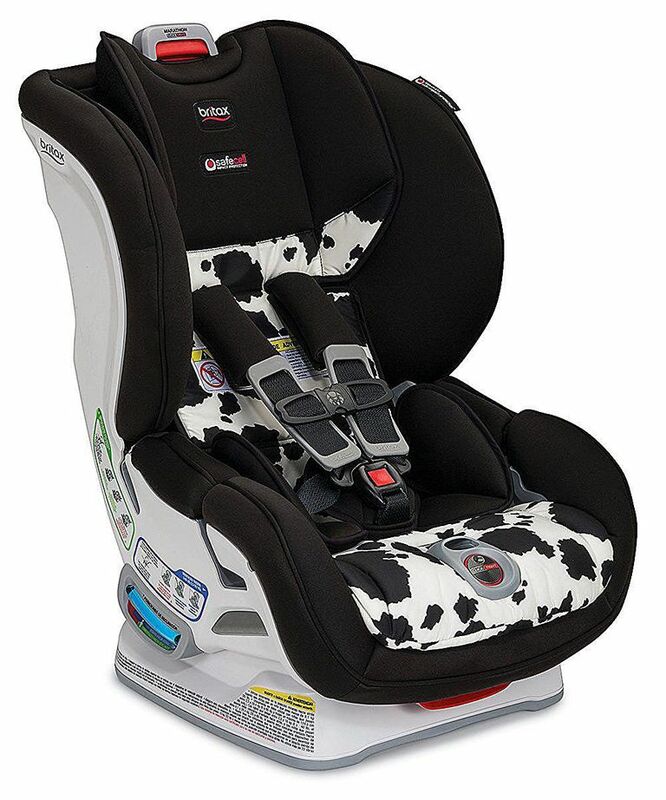 Britax Marathon is a convertible car seat with a 5-point harness for babies 5 to 65 pounds. May be installed rear-facing to 35 pounds and forward facing to 65 pounds and 49 inches tall. Versa-Tether allows top car seat tether to be used rear-facing and forward-facing. The removable seat cover is stain-resistant and available in many colors and patterns. One of the nicest features of the Britax Marathon G4.1 car seat is the built-in lock-off clips that keep the car seat installed tightly when using traditional seat belt routing. Just slide the seat belt through the lock-off, tighten, and close the lock-off. If you're installing the Marathon car seat with LATCh, the trickiest part is figuring out whether the LATCh belts are set for rear-facing or forward-facing. They come set up for rear-facing, and you'll have to slide them around on their metal bar to switch positions. Aside from that, LATCh installation is incredibly easy in almost any vehicle. The push-button LATCh connectors are very nice. On the ClickTight version, you must follow the instructions for the correct belt path so that the seat belt or LATCh belt are properly snugged up by the ClickTight system. The shell of the Britax Marathon car seat is quite tall, and the top harness slots are at about 17 inches. Most children will outgrow this car seat by height before they reach the 65 lb weight limit. It's not uncommon for kids to fit in the Marathon until they're five or six years old, when their shoulders finally go over the top harness slots. On the other end of the scale, the Marathon may not be a good choice for some newborns. There's just one lower seat pad to fill the extra space in a large seat also built for toddlers, and the bottom harness slots, at 8.5 inches for the G4.1, are not as low as those of most infant car seats. The Marathon ClickTight has the bottom harness slots at 7.5 inches, so it's more likely to provide a good fit to a newborn. Marathon is a large car seat, and some small car owners may have trouble with proper installations, particularly rear-facing, so check the fit before purchasing. The base makes for easy recline adjustments when rear-facing, too, by simply pulling a handle. Plush covers and thick padding provide a comfy ride for baby, and the covers are available in many patterns to suit any taste.